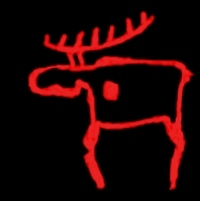 The elk in Finnish petroglyphs..
Harald being baptized by Poppo the monk..
Gunnhild convinces Eric Bloodaxe to skill the Finnish wizards..
Harald established control over the trade route along the Norwegian coast.. In the sagas, Gunnhild is most often depicted in a negative light; she is described by Jenny Jochens as known for her "power and cruelty, admired for her beauty and generosity, and feared for her magic, cunning, sexual insatiability, and her goading"..Gunnhild is often connected with sorcery, as seen throughout the Icelandic sagas.. This magical ability may be recognized in part due to Gunnhild's affiliation with the Finns, having lived in a hut with two Finnish wizards in Finnmark and learned magick from them, according to Snorri in Heimskringla.. Also as seen in Heimskringla, Eirík first made the acquaintance of Gunnhild when he was younger and off on a raid in northern Norway.. His men had stumbled upon the Finns' hut where she was staying, and described her as "a woman so beautiful that they had never seen the like of her"..In Karelia it was believed that a bird brings the soul to a newborn baby, and that the same bird takes the soul with it when person dyes..Gunnhild remained resilient to maintain power for the rest of her life, acting as Queen Regent to her son Harald, and continuing to be a major deciding factor and source for political advice..According to tales, foreign seafarers bought ropes tied in knots from Finns.. In the languages of Finland and Estonia alone, may be found more than 33,000 native folk-melodies, 55,000 folk tales, 125,000 riddles, 135,000 superstitions, 215,000 proverbs, 200,000 folk songs..Do you like the sea?. Because of the very nature of life in prehistoric, ancient, and medieval Finland, the Finns relied heavily on hunting for survival. As such the animals that they hunted became vital to their survival, and they were treated with respect..The bear was considered sacred.. The pagan Finns believed that it came from the sky and had the ability to reincarnate..A celebration known as Karhunpeijaiset ("celebration of the bear") was practised whenever a bear was killed and eaten.. The ceremony was designed to convince the bear's soul to reincarnate back into the forest.. After the flesh was eaten, the bones were buried, and the skull placed on a venerated pine tree known as kallohonka..Before going hunting, the Finns would pray to the Emuus, or ancestral mothers of various animal species, for help..From ancient drawings, petroglyphs, it is clear that the elk was a very important animal.. It appears much more than bears do..Many water birds were holy for Finns and other Finnic peoples..For example, there are many stories about a bird creating the world.. In many traditions it was believed that the world was created by the egg of a bird..I am the mother of everything and you are my egg..
Last edited by lightgiver; 05-09-2015 at 12:11 AM.